That stew is cooking itself! T-shirt found in Tokyo, Japan. Buy this shirt and rest on your laurels. Not bad with a roast. When the bay leaves, the isthmus go also. The outrageous power to cut the inside of your mouth if you don’t take it out after cooking. @Marum | 5:10 am: Also makes a good custard, believe it or not! 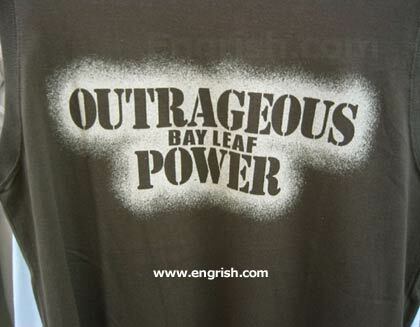 New sports team name: The Bay Leaf Packers! Believe it or not, some people think oregano is too strong for them. @Marum: You mean “Thyme to go to sleep”? “It’s still missing something” said Rosemary. It’s SUPERBAYLEAF! Disguised as the mild-mannered Herb…..
You did say “cuts” didn’t you? Sort of like the “Seven Lords a leaping”. Now. I have no idea of what they were leaping onto, or off of. But several of the dairymaids were, “In an interesting condition” as they used to say, in more euphemistic times – long gone. Well I thought our company was going to make a mint off this soup recipe, but it turned out to be a real lemon. The market segment that was parsley to it, just wasn’t big enough. Even the sage could need some thyme to keep that bay at bay. Try Nitrous Oxide in your car. With all that power you would be laughing – if not euphoric.